Pre-qualified home plans are blueprints designed to earn the ENERGY STAR® name, and incorporate energy-efficient practices and specifications to meet the rigorous ENERGY STAR guidelines set by the EPA. To qualify, a plan is independently reviewed and verified by a team of professionals, an architect or engineer and a HERS rater, to include energy-saving features and construction practices that will result in a home that is at least 20–30 percent more energy efficient than a standard home. 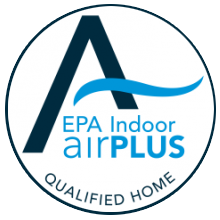 EPA created Indoor airPLUS to help builders meet the growing consumer preference for homes with improved indoor air quality. EPA developed additional construction specifications to help improve indoor air quality in new homes. Construction specifications include the careful selection of and installation of moisture control systems; heating, ventilating, and air-conditioning systems; combustion-venting systems; radon resistant construction; and low-emitting building materials. Ask Green River about the Indoor airPLUS qualification for your next new home. For more information on this program, go to http://www.epa.gov/indoorairplus/. Which Certification is Right for Your Building Program?